November is an exciting time in the Sydney garden. Planting of summer vegetables takes place, there is an abundance of spring vegetables and the mango trees complete their flowering and set their fruit. Panicle of Maha Chanok seedling tree in heavy flower... November 3. Firstly, in June, after some unseasonally warm weather, bunches of precocious flowers were removed from our Maha Chanok seedling tree... fearing that the tree would attempt to set fruit in the middle of winter! Regardless, the tree has been in very heavy flower this year, its fifth year since planting. Conversely (and secondly), throughout early Spring (September and October), we have experienced cooler weather than recent years. 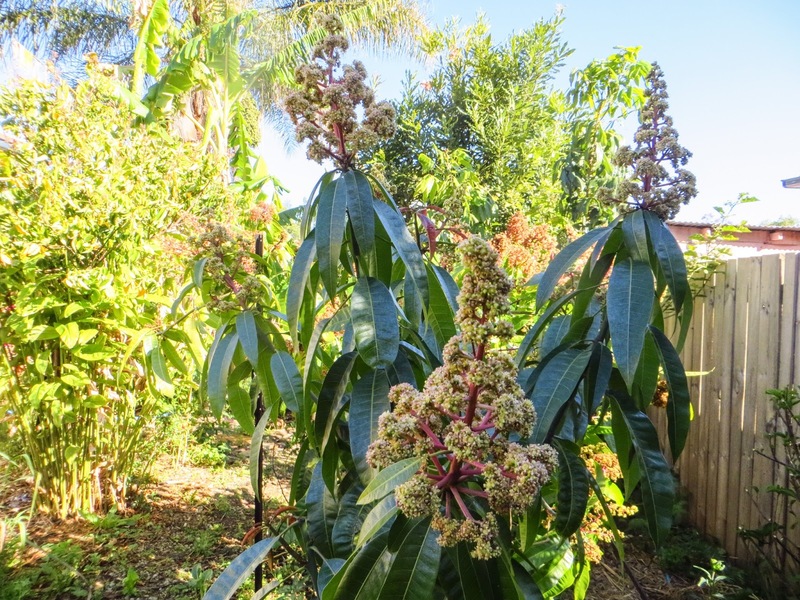 As a result, our mango trees are still under heavy flower, in the first stage of fruit set. This contrasts with the past two years when the Maha Chanok seedling tree had set many juvenile fruit. First fruits setting on Maha Chanok seedling tree... November 3. Encouragingly, our Harumanis seedling tree is enjoying its first flowering, three years from planting. A sturdy young tree, with a little luck, the Harumanis may set one or two fruits in its first season... time will tell! 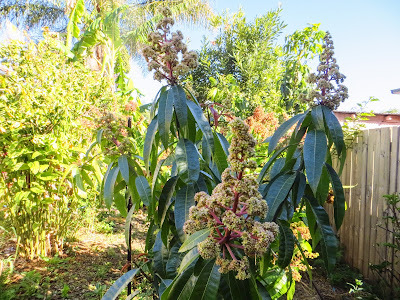 For a comparison between this season's flowering and the past two seasons, check the mango label above, and scroll to past 'Mango Flowering' posts.